2017 was a weird year and it has taken me a month to work out how I want to summarise it. It was a year in which I carried a deep and underlying feeling of melancholy. Firstly sadness that the strongest nation on earth should step back from leading, pioneering and guiding and unashamedly put itself first as a slogan. Secondly sadness that our own nation continues to step back from co-operation, sharing and stepping forward together with other nations in favour of the more aggressive, and surely eventually doomed, policy of taking back control. It was a bad year. I was very grateful to Stuart Maconie for a throwaway comment on BBC 6 Music last month - 'New music' he said '...is music you haven't heard before.' He said this in response to a reader thanking him for introducing him to The Lemonheads. In a year in which I had three months sabbatical leave a lot of reading was catching up. Lee Child and Chris Brookmyre kept me page-turning when that was necessary. As did Robert Harris' Conclave. Tim Marshall's Prisoners of Geography educated me, James Rebanks' The Shepherd's Life moved me, John Lanchester's Capital impressed me, Paul Beatty's The Sellout made me think, Stanley Donwood's Slowly Downward worried me, as did John Sopel's If Only They Didn't Speak English but for different reasons. I finally read Peter Carey's True History of the Kelly Gang and it is one of the finest books I have ever read. Podcasts were a new thing for 2017. I started with the wonderful S-Town and moved on through Serial 1 and 2. This led me to subscribe to the excellent This American Life. I now regularly listen to The Political Party and Richard Herring's Leicester Square Theatre Podcast. I dip into Rob Bell's The Robcast but find it annoying that he crams 20 minute's material into an hour. My heroes really shouldn't do this. Honourable mentions to 50 Things That Made the Modern Economy, The Infinite Monkey Cage, Crowd Science and More or Less, all of which were catch-ups rather than Podcasts. Spent less time at the movies than I would have liked to (Ghost in the Shell good fun) but enjoyed DVD Scandi-noir a lot - Follow the Money, The Bridge, The Killing I, II and III. Line of Duty was also excellent. Any year that we see Stewart Lee perform live he is going to be the best comedy gig and he was. David Sedaris reading his stuff was a good evening out. Music gigs were thin but Laura Marling supported by the excellent Ethan Johns was good. I enjoyed Ghostpoet but not The Marble Factory setting in Bristol. Sad to see the end of The Barn pub at Wraxall. Coates House, Nailsea now gets our custom. Bordeau Quay in Bristol bit the dust (it had been going down for a while) but the Pony and Trap at Chew Magna goes from strength to strength as does WB at Wapping Wharf. 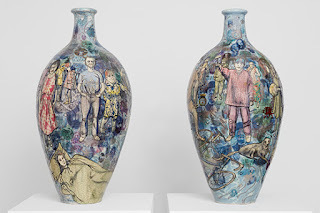 Grayson Perry's The Most Popular Art Exhibition Ever! at the Arnolfini was insightful, moving and strived to explain the two parts of divided Britain to each other. Here's to more and better culture in 2018.